Tremolo is a great effect that can be used to add tension and weight or a shimmering texture. Tremolo is a fast oscillation of the bow, unmeasured by default. Tremolo, like harmonics and pizzicato, is a technique where the use of samples in composition has given composers a false sense of reality. For some reason, just like sampled timpani rolls, sampled tremolo is performed way faster than I have ever heard it in the real world. In reality, the speed is related to the dynamic, just like it is in normal bowing, but always slower than the tremolo samples on the market. Tremolo is most often performed at the tip of the bow. It is much easier to play rapidly and with a subtle attack where the weight of the bow is the lightest. There is never any need to mark ‘at the tip’ for any tremolo, it is the default. See here for a discussion of fingered/keyed tremolo. Unmeasured tremolo is notated by marking the duration as thirty-second notes, meaning three slashes. As the durations get shorter, fewer lines are used. This is the same theory we use for notating drum rolls. Note in the example that there is no tie between bar one and two. None is needed; there will be no gap or re-articulation. This will sound like nine beats of tremolo. You would need to put a tenuto or an accent on the second C to force a re-articulation. Due to the way we now work with sequencers, MIDI files, and notation programs, many people now use ties on tremolos. This is redundant and historically incorrect, but seems to be the norm these days. You will notice I did tie the last F. This is to indicate that I want it ‘off on 3’. I do not want the players to articulate beat 3 at all, just ‘touch it’ with the end of the tremolo. Even though I state that thirty-second notes always mean an unmeasured tremolo, there is one place where I have found the players cannot help themselves and will play measured. This is a mainly a physical issue, as the players are human not computers. When a pattern such as the above has to be played fast, the players will all go to a measured tremolo and perform two bows per note. Recently I was listening to a mock up and the composer had played in a tremolo chord a bit like a harp arpeggio. Writing out different start times for each note would lead to a messy performance at first, and then they would probably all end up playing together by the third take. Here is what I did and it sounded very cool, without being a mess. If you need to break the default and want a measured tremolo, there are two common ways to do it. There are lots of advantages to this notation. For one, it takes less space, so you can fit more measures on each system. Secondly, if you need to change the notes, it is easier as there are fewer to change. It also has a cleaner, less cluttered look. A single slash gets you 8th notes. The physics of the tremolo need to be considered. In this example there are a few things that will happen that will affect the sound. The players have to cross from the E string to the D string. This would be an issue even without the tremolo. This happens all the time and is not really noticeable in the real world. The players will finish the C a little early in order to leave time to raise the bow and cross to the D string. 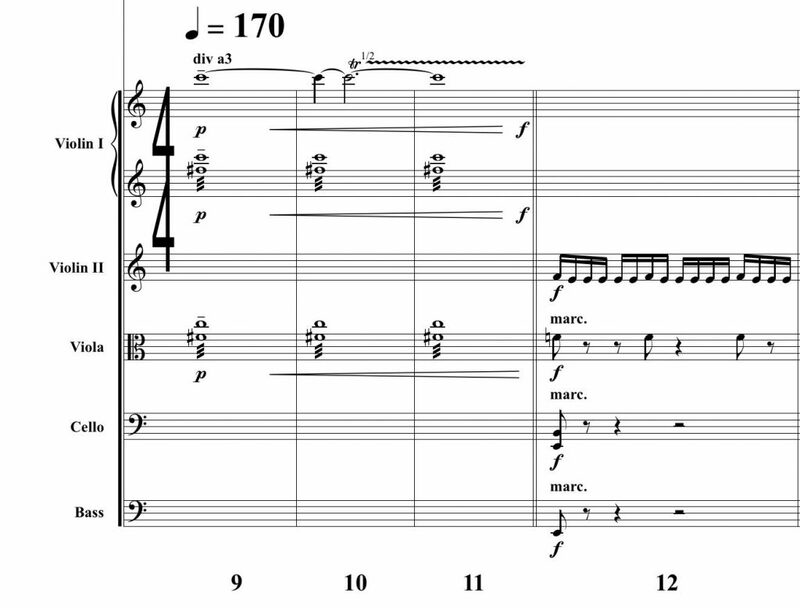 As an orchestrator, I know this will happen, so if I am fine with the gap, I will leave it written like this. If this is with other instruments, I might write in the rest so I can give it to the others and keep the end of the phrase together. However, the bigger issue with this is that it is impossible to go right from an unmeasured bow to a perfectly measured one. It will take the players a couple of beats to get in tempo and lock together. You may not be bothered by this in the concert hall, but it will be obvious in the studio. In the studio we can cheat and pick up the second bar, playing the first to the end, stopping, then restarting. If this were loud and I needed everyone to play, this is how I would do it. If it is not important that the C go right to the bar line, I might bring them ‘off on four’. 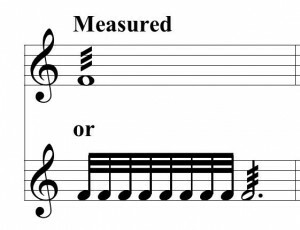 Note that it is still extremely hard to go to the metric rhythm with a short gap, but easier than with none. If this was not loud, I could use the firsts for the C, then have the seconds or violas play the rhythm. This actually came up in a cue recently. You can see I used the firsts on the tremolo and saved the seconds for the rhythmic pattern. The violas are OK to play, they will have a slight gap, but they are covered by the brass here. The firsts are not covered and so have to play to the bar line. 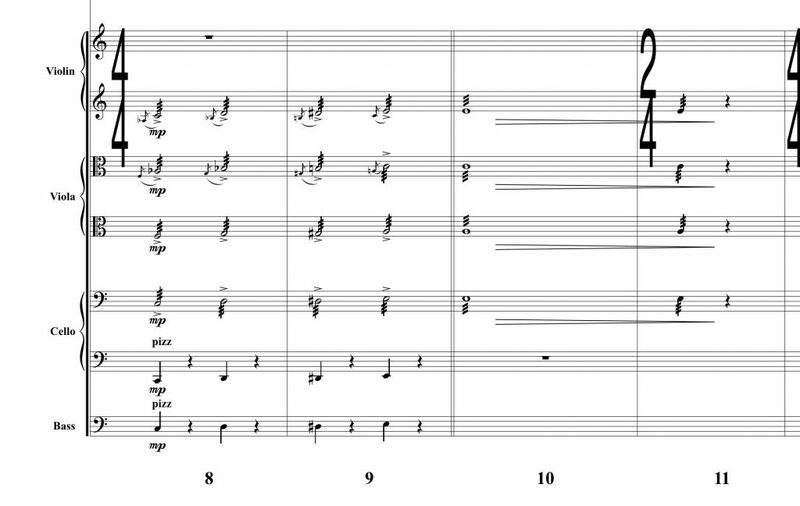 Here are some orchestration examples. For wind and brass instruments, tremolo is performed by flutter tonguing. The notation is exactly the same as tremolo for strings and percussion. It is common to label the part as ‘flutter’ as well as the tremolo articulation, but I feel this is redundant. The notation is sometimes used for a valve tremolo (same notes played rapidly by alternate fingerings), but one would go out of their way to label this if it were what you were asking for as it is not used very often. Flutter tongue is the default. A tremolo is performed as a roll. On all pitched instruments and the bass drum it is performed by rapid singles strokes. On the snare drum each stroke has multiples, two or more depending on the style of the music. I was wondering abaout the necessity of ties: consider the case where you have to the players to change the notes in different time points, some in the downbeat, others in a eight note offbeat, others in the 3rd note of a quarter note triplet, for example. Maybe the use of ties could be justifiable, as for indicating where the player must change the pitch, while carrying the tremolo notes. I’ve seen this on a Kaija Saariaho Score, for example. The Z does make sense, but as it has not become standard, one has to wonder which method would get more questions. The rule is that 3 lines is unmeasured. There is no clause that states in slow tempos it is different. However, I know some people seem to think it may. In those cases it is fine to clarify if you want. I am not convinced though that just adding the word ‘trem’ clears up unmeasured or not. They are both types of trem. That is why I would say that is a waste of toner! I am never against clarifying if there is ambiguity. What I think is silly is adding text when there is no ambiguity. Some questions on the last example: div a3 means that only 3 of the first violins play(2 the tremolo and 1 the high c)? How do you keep the dynamic balance when 3 players play over the whole violas section? is that important or not? The div a3 means the whole first violin section divides into 3 groups, not3 players, so balance is not an issue. If I were doing those few bars in isolation, then I would do it a little differently. However, in this case, I am preserving the seconds for the rhythm. If I had them playing there would be issues of range/string and going from unmeasured to measured bowing. the ‘z’ notation is not my invention: I’ve found it from other scores. It’s advantage: ‘z’ looks similar to the three slashes, but it is different enough to avoid stopping rehearsals in order to explain whether the tremolo is measured or unmeasured. String players used to hate tremoli because it is often a signal of bad orchestration. In such cases, the score makes extensive use of tremoli, making the piece unnecessarily tiring. Not all pieces are badly orchestrated, but remember how tiring are the Bruckner’s symphonies for example, among MANY others. When tremolo is a must, I’ve found that “z” is the contemporary notation better suited to indicate it instead of the ambiguous three slashes. Even if the player is not used to this notation, a simple and direct answer (maybe a bula, although players may not read it) is enough to make the playing clear. You are right about too much tremolo. I am working on an orchestration right now that has too much in and I am talking a lot of it out. I think some people have a false belief that tremolo is louder, but I don’t think it is. Not sure about the ‘z’ notation. The only place I have seen or used it is in percussion parts as a single buzz or drop stroke. I have no problem with the current system of notation. Curious as to why you want to change it?